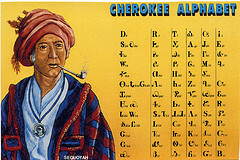 The Cherokee Language: Can it be Translated? Last summer while I was researching various journals on translation testing methods, I constantly ran across articles mentioning the difficulty surrounding Cherokee language testing, specifically in the Bilingual Education Program. Although I don’t have the articles anymore, the gist was that under several testing programs it was nearly impossible to create an equal English language literacy and Cherokee language literacy test. In testing young elementary school children of both Cherokee and non-Cherokee background, the program administrators found that bilingual children achieved noticeably lower scores on the English language tests, and that these scores were not due to a limited exposure to English but due to the cultural-linguistic nature of the Cherokee language. The problem with technical academic journals is that the amount of background information or history is limited. While the studies made sense and were useful regarding the information I needed for my own project, I was left wondering what exactly were the differences between Cherokee and English, and why exactly the two languages could not be accurately tested in a bilingual situation. I’d nearly forgotten about the issue until recently when I picked up a copy of Christopher Camuto’s book, Another Country. I read Camuto’s three published books (the three I could easily access, he recently published a fourth book, Time and Tide in Acadia in 2009) in backwards chronology, starting with his most recent, Hunting from Home, then his second book, A Fly Fisherman’s Blueridge. As those titles suggest, Camuto’s writing is interested in the Appalachian landscape, in hunting and fishing and the environment of the Appalachian mountains. Camuto is also interested in language and the way language works in relation to the environment. In his first book, Camuto explores the relation of the Cherokee people to Appalachia and spends a great deal of time discussing the Cherokee language. Cherokee is a Creek Indian word meaning, “people with another language.” Native speakers actually call the language Tsalagi, but they typically do not have a problem with the term Cherokee. While the book is marketed as centering around two central issues—the reintroduction of the red wolf, Canis rufus, to the Great Smoky Mountains, and the history, culture, and mythology of the Cherokee people—a much larger section of the book is devoted to the Cherokee than to the wolves (perhaps due to the failed reintroduction of the wolves—there’s only so much you can write about that). Very quickly I discovered many of the answers to the questions I asked last summer about the Cherokee language—specifically why it is so difficult to translate. The five categories in Cherokee, each loosely attached to a physical feature, are thought to be vestiges of an earlier stage in the language, one dominated by the names of things…the system invites the speaker to carefully consider the nature of every action, how one thing might be treated with respect to another, as if kinship, philosophically speaking, extended beyond the idea of the clan. So, for example, the form of the verb to hold you would use to say that you held an object would depend on the nature of the object—whether it was animate, flexible, long and rigid, liquid, or round—the last a catch-all for anything not assigned to one of the other categories. This application of the nature of the object to the verb form obviously complicates the language, probably far beyond what any written multiple-choice language test could ever assess. And as Camuto points out time and time again throughout the book, the Cherokee language is immediately dependent on the landscape. After being driven out of the forested mountains in the Southeastern United States to reservations in the Plains region, much of the language became useless—a relic of a home no longer accessible. While these two sections do not adequately explain the complexities or beauty of the Cherokee language—it certainly remains somewhat obscure in my mind—it does help explain why a bilingual assessment of Cherokee-English children is nearly impossible. How could one come up with a balanced, 100% testable series of questions regarding how a bilingual Cherokee child reads a sentence? In many circumstances, the simple sentence: “I threw the red ball” could be translated in several different ways: how hard was the ball thrown, how big is the ball, what material is the ball made out of, etc. all play into the way the sentence is translated. Certainly the gist of a sentence could be translated, but the English-Cherokee interplay of language is entirely object-person specific (and, in many cases, landscape specific). Creating a multiple choice test that covers all those factors would be an expensive and daunting task. Impossible? Probably not. But definitely difficult. Concrete sample sentences would be appreciated. I am looking for a Cherokee word for “tall” and ‘robin’.Any help would be appreciated. I am looking for a Cherokee word for “service” or “aid” or “assistance” You get the idea.